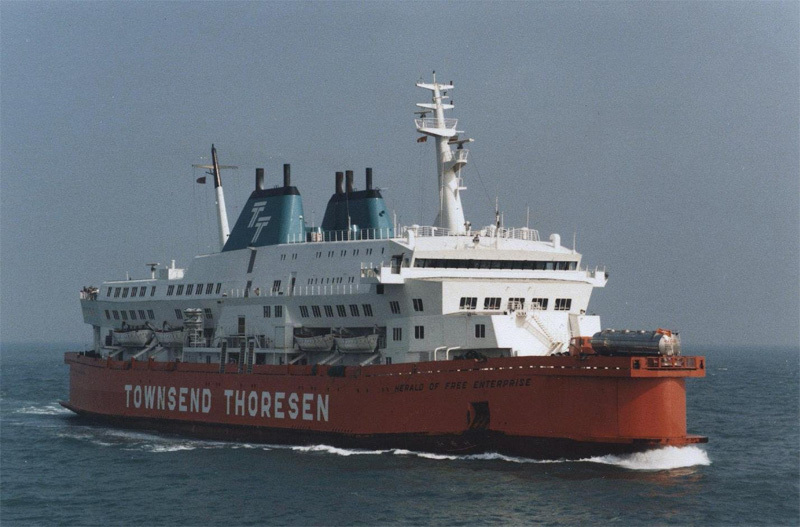 On the evening of 6th March 1987 MS Herald of Free Enterprise, a Townsend Thoresen branded RORO passenger and car ferry owned by European Ferries capsized shortly after sailing. The ferry left the Belgium port of Zeebrugge bound for Dover. At 7:20 the Herald passed out of the inner breakwater and in to the shipping channel, by 7:28 she had capsized. 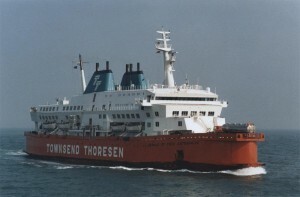 The Herald was one of 3 spirit class ferries that had been designed to operate on the Dover-Calais route however on this voyage she had been deployed on the Dover-Zeebrugge route. At the time the ferry left Zeebrugge 80% of her crew were embarking upon the return leg of the second Dover-Calais round trip completed during their 24 hour shift. This meant that the majority of the vessels crew were tired. Mark Stanley was the bosun’s assistant on the vessel and it was his job to close the bow doors. At the time the vessel sailed from port he was asleep in his cabin and didn’t hear the harbour stations sounding. This was the que for the bow doors to be closed and all crew members to report to their harbour stations. Chief Officer Leslie Sabel recalls seeing a man in orange overalls whilst he made his rounds, he assumed this man to be Mark Stanley and therefore that the bow doors had been closed. The Chief Officer returned to the bridge, which was his harbour station and reported that they were ready to sail. Captain Lewry could not see the bow doors from the bridge and as there was no other way to substantiate they were closed relied upon the chief Officers report being accurate. Captain Lewry then dismissed the second officer and told Chief Officer Sabel to take his dinner break. This meant that upon sailing the Herald’s bow doors were open. To compound matters, due to the incompatibility of the design of the ferry and the linkspan at Zeebrugge the ferry’s vehicle decks could not be loaded simultaneously as they could at Dover and Calais. The loading ramp at Zeebrugge could not be raised high enough to reach E deck which was the upper vehicle deck. To combat this the ferry was lowered by filling the bow ballast tanks, allowing vehicles to be driven on to E deck. This meant that when the ferry sailed from Zeebrugge in addition to the bow doors being open, she was also 3 feet lower in the water than usual. The vessel began to pick up speed and as she hit 15 knots water began to pour in at a rate of 200 tons per minute. As the vessel filled the bow dropped even further and the water flow increased. The sound of the water gushing on to the vessel was heard by a steward on H deck, the deck on which the engine rooms, stores and passenger accommodations were situated. He assumed that a pipe had burst and called the assistant purser. The purser then put out a call for the ‘ships carpenter’ over the ships public address system. The ‘ships carpenter’ was a code which was used in the event of a general alarm to avoid alarming the passengers. At 7:27 the helmsman reported that the vessel wouldn’t respond. Captain Lewry immediately put the engines in to reverse. Unfortunately by this point the vessel was already listing 30 degrees to port and this had no effect. The vessel righted for a moment before capsizing to port and settling on a sandbar on her side, the sandbank prevented the ferry from completely sinking in deeper water. The water reached the ship’s electrical systems and destroyed both the main and emergency power which left the ship in complete darkness. At the time the Herald capsized there were 459 passengers and 80 crew members on board and she was carrying 81 cars, 3 buses and 47 lorries. Most of the passengers were relaxing in the passenger lounge or in the cabins below deck. There were also 4 lorry drivers asleep in their cabs in the bowels of the ship. When the vessel began listing this alerted the passengers in the lounge that there was a problem, unfortunately due to the speed of the capsizing there was no time for the passengers to act. The lights went out and water began to pour in. At this time Mark Stanley was thrown out of his bunk. Realising what had happened he ran to the lifeboats grabbed an axe and smashed a window of the passenger lounge. Whilst smashing the glass Mark Stanley sustained a deep cut to his right forearm. The passengers were thirty feet below and could not reach the windows to get out. Mark Stanley therefore lowered a rope through one of the windows and climbed down to re-assure passengers that help was on the way and assist in any way he could. He then climbed back up and told 2 soldiers who were on leave and on their way home to get a ladder. Mark Stanley continued to assist until he passed out due to blood loss and exposure to the cold water; he was then covered with an overcoat and taken to safety. Several crew members aboard the dredger Sanderas saw the capsized Herald and at 7:36 the Captain alerted the port authority at Zeebrugge. Upon receiving this notification the port authority activated its harbour rescue plan. Tugs surrounded the Herald and a team of divers were delivered to the ferry by helicopter within thirty minutes. The Belgian Navy were on exercise in the area and also assisted in the rescue operation. The dive crew leader Lieutenant-commander Guy Couwenbergh entered the passenger lounge to begin the rescue operation. The ladder that the soldiers had brought was too short to reach down to the passengers so Couwenbergh instructed his divers to find rope. The rope was lowered in to the cafeteria and tied around a passenger who was then hauled up and through the window. This process was laborious and the passengers were weak from exposure to the cold water. More windows were smashed and ropes lowered but many of the passengers were too weak to climb up them. A wicker basket was found to haul up the children. The accident resulted in the deaths of 193 people, most of whom succumbed to hypothermia. The Secretary of State for Transport ordered a formal investigation in to the capsizing of the Herald using powers granted under The Merchant Shipping Act 1970. The investigation was presided over by the Hon. Mr. Justice Sheen, Wreck Commissioner. Sir Barry Sheen served as Admiralty judge of the High Court from 1978 to 1993. The only powers given to this court were investigative. It was to determine who should contribute to the investigations costs and was able to suspend or remove a Merchant Officers Certificate of Competency should that be required. The report concluded that the Herald sank because it had sailed with the bow doors open and attributed this occurrence to serious negligence on the part of several crew members and the owners, Townsend Car Ferries Limited. The report also highlighted several areas of concern relating to the spirit class vessel design and also to the companies operating policies. The investigation found that the Herald was overloaded on weight and that this was a regular occurrence which Masters had alerted shore side management of, however found that this ‘was not in any way causative of the casualty’. The report names several crew members negligence in their duties as contributing factors in the capsizing of the Herald. Mr Mark Victor Stanley is named as being the crew member responsible for ensuring the bow doors were closed, the report acknowledges that Mr. Stanley accepted responsibility for this and also that he will suffer remorse for many years to come. The report criticised the attitude of Mr. Terence Ayling who was serving as bosun on the Herald. He left G deck for his harbour station knowing that the bow doors were open and the assistant bosun was not present to close them. When questioned regarding his actions he advised the enquiry that he did nothing about it because it had never been part of his duties. Chief Officer Leslie Sabel gave evidence to the enquiry and was found to have given a conflicting statement to that which he had given earlier however the investigation recognised that Mr.Sabel had been seriously injured during the capsizing and that this may have affected his recollection of events. Judge Sheen questioned why the failing of one member of staff could lead to such a catastrophe and why systems had not been implemented to ensure that the doors had been closed, particularly as this was not the first time a spirit class ferry had sailed with the bow doors open. The jury in the coroner’s inquest into the incident returned verdicts of unlawful killing in 187 cases, and 7P & O employees were charged with gross negligence manslaughter. A case was also presented for corporate manslaughter however failed when the presiding Judge Turner instructed the jury to acquit the company because the various acts of negligence could not be attributed to a “controlling mind”. Despite the collapse of the case it did set a precedence for corporate manslaughter being admissible in an English court. 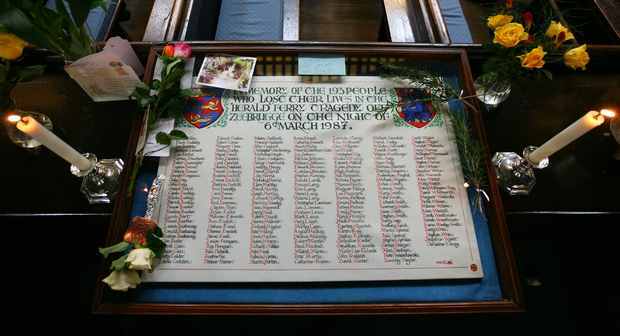 On 6th March 2012 a memorial service was held at St. Mary the Virgin church in Dover to mark the 25th anniversary of the disaster. The service was organised by the Sailor’s Society and was attended by more than 250 bereaved families and friends as well as survivors of the disaster. During the service the names of all the 193 passengers and crew who perished in the disaster were read out, it took over 10 minutes to read the list and stars were handed out on which the congregation wrote messages which were later transcribed in to a book of rememberance. A memorial garden with 25 white roses was created on the seafront at Dover to mark the anniversary . After the church service the garden was dedicated and flowers were cast in to the sea in rememberance.